A few years ago, I spoke at the USA Hockey ADM (American Development Model) coaches clinic and gave my Motivating Female Athletes presentation. Over time, the presentation has evolved and I always manage to tailor each talk to the particular group I’m speaking with, but the bones are pretty much the same. This first section (which is about fourteen minutes) is a place I’ve been doing lots of research lately. It talks about the socialization of females and begins the conversation about building team chemistry. I hope you like it and let me know if you’d like to have me speak to your group! You can check out different topics here. 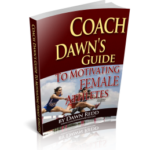 Below is a link to an eBook that Coach Dawn Redd-Kelly has written regarding Motivating Female Athletes.